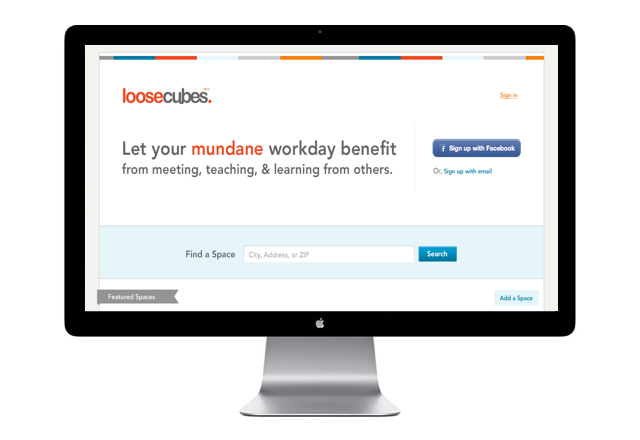 Loosecubes is world’s biggest office sharing community that connects companies with empty desks and creative people who need workspace. TechCrunch calls it “The Airbnb For Workspace” and the premise is to cultivate serendipitous creativity by bringing disparate people together. The project required designing for two separate, but related, users: those wanting to host their space and those looking to reserve a workspace. I needed to solve in-depth design challenges such as “Recommended Spaces”, in which they tap into your social graph (via Facebook Connect) to recommend office space based on your friends, location, and line of work. A few of the features included: onboarding, payment system, messaging system, advanced search functionality, etc. Featured in Time’s 50 Best Websites 2012 as well as The Wall Street Journal, Mashable, Huffington Post,TechCrunch, among several others.